250 calories, 2.6 miles of walking, or 78 minutes of walking: which would cause you to eat less? We’ve written before about exercise equivalents over calorie counts, citing some initial encouraging data. Now there are more data, also encouraging. 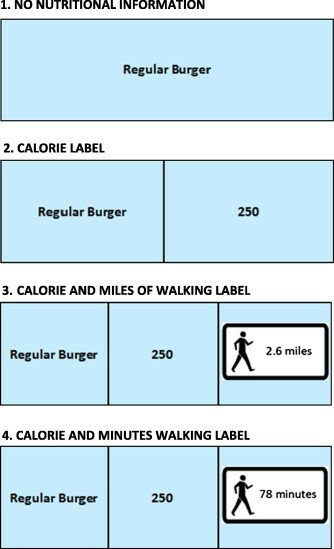 The new article is called Potential effect of physical activity based menu labels on the calorie content of selected fast food meals. These authors tested four variant menus “(1) a menu with no nutritional information, (2) a menu with calorie information, (3) a menu with calorie information and minutes to walk to burn those calories, or (4) a menu with calorie information and miles to walk to burn those calories”. The authors found, as before that calorie counts decreased the amount of calories people chose to consume, and that exercise equivalents (telling you how much walking time or walking distance you’d need to burn off those calories) increased the effect. We’d like to know the effect size of (3) vs (4) and are awaiting a full copy of the paper. 250 calories, 2.6 miles of walking, or 78 minutes of walking: which would cause you to eat less? was written on April 9, 2013 and filed in Articles,Ideas,Research News,Tools.